Our Postpartum wrap is based on a traditional design that gives 360° support to a mother’s postnatal body. The material is unbleached cotton which is soft yet durable for hours of comfort. The wrap is easy to put on and most comfortable when worn under loose clothes. A postpartum wrap is an important recovery devise used in many cultures for a faster recovery from child birth. We strongly recommended its use. Wear binder from Day 3 for 40 days a minimum of 12 hours per day for best results. If you could wear 24 hours maximum results will be seen. Most women find it convenient to wear over night when sleeping. Apply Firming Herbal Blend on stomach area first. Please refer to the illustration sheet below. Provides full support from below the breasts down to the hip and buttocks to aid in the release of water retention. For the toning of stretched skin in the torso region. Encouragement of the cervix to shrink and recover its pre-pregnancy size. Support back posture while breast feeding, so slouching doesn’t occur. Note: The binder should be worn from under the breast to just below the buttocks. If binder is longer than that area, fold the binder down under the breast area and adjust the number of ties used. Caution: DO NOT WEAR BINDER VERY TIGHTLY. 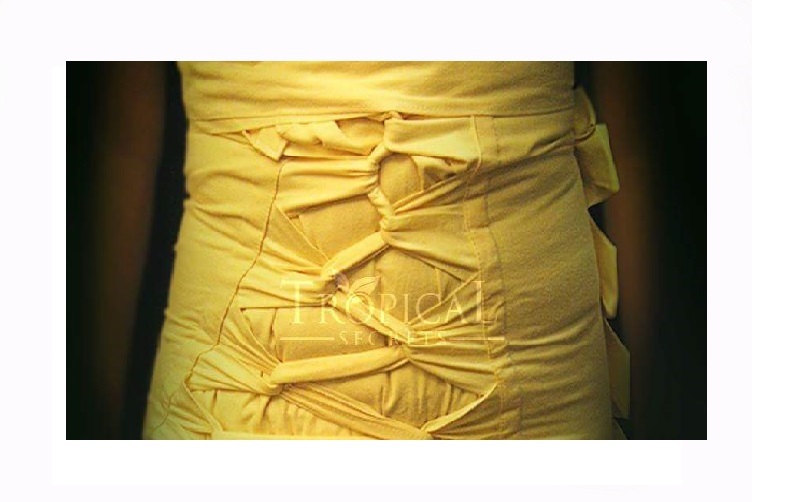 Binder is to be worn snug for a comfortable fit but not exceedingly tight to cut off circulation. If you feel dizzy or light-headed loosen the binder immediately. If skin irritation occurs discontinue usage of binder. Caesarean birth: Use after wound is dried/ stiches are removed. Wash when odorous or dirty; hang to air-out when not wearing. Put in a delicate laundry bag to prevent straps from getting caught on inside of machine. Wash in COLD water on gentle cycle or hand wash.
Used mild detergent, NO BLEACH. Dryer: use the lowest setting on dyer. DO NOT over-dry and take wrap out of the dryer when no longer wet as shrinkage of 5-10% may occur. Air dry: hang or lay flat. DO NOT wear if wet as may irritate skin.